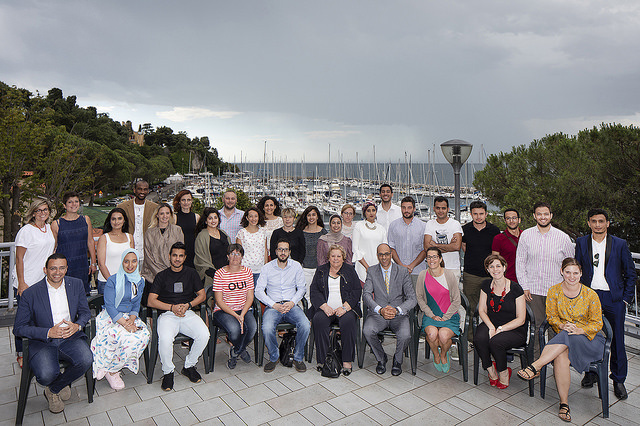 The Summer school on blue growth in the Euro-Mediterranean region 2018, jointly organised by the Euro-Mediterranean University (EMUNI) and Italian National Institute for Oceanography and Applied Geophysics (OGS) was successfully concluded on 27.6.2018. OGS is promoting the international school since 2014 supporting this higher education programme to increase professional skills and quality of research in the field of marine sciences, environmental protection and integrated management of coastal areas within Mediterranean countries. The 2018 edition took place over 17 days in three phases: the first week was conducted in a distance learning format, then the programme was held in Piran and lastly in Trieste. The programme included 70 teaching hours, both in form of interactive lectures, field trips and students active presentations of their blue growth solutions. The teaching faculty included experts from both North and South Mediterranean, while field trips demonstrated best practices of blue growth in the Slovenian and Italian part of the Adriatic coast (e.g. Port of Koper, Škocjanski zatok nature reserve, Sečovlje salt plants, Fonda fish farm, Grado Marano Lagoon). The training was enabled by the support of the EU’s Erasmus + programme, Union for the Mediterranean (UfM), Italian Ministry of instruction, university and research (MIUR) under its 5+5 initiative, the Central European Initiative (CEI) and French Institute. The 28 participating individuals came from 19 countries (Albania, Croatia, Egypt, Greece, Iran, Israel, Italy, Jordan, Lebanon, Libya, Mauritania, Montenegro, Morocco, the Netherlands, Palestine, Portugal, Spain, Tunisia, Turkey). As graduates of various university programmes (e.g. marine sciences, fishery, water management, renewable energy, industrial management and engineering, materials engineering, European policies, entrepreneurship, food and tourism), they represent the interdisciplinary mix that is needed in approaching challenges of blue economy. The participants expressed their appreciation for the organisation of a dynamic programme of high quality that enabled them to improve their knowledge and skills in themes of blue growth. They have also developed a powerful network among themselves and with the instructors, which can serve to initiate projects and other forms of cooperation.